Oil giant BP is pushing for new drilling rights in Egypt as it sponsors a major new exhibition on Egyptian archaeology that opened last week at the British Museum in London. The news comes after documents obtained by campaign group Art Not Oil revealed how last year BP used its partnership with the British Museum to gain access to Mexican and Australian policymakers via sponsored exhibitions on Mexico and Australia, two countries where BP has ongoing oil interests. Speaking to Unearthed, a museum spokesperson confirmed that representatives from both BP and the Egyptian government were in attendance at the Egypt exhibition’s opening event last week. 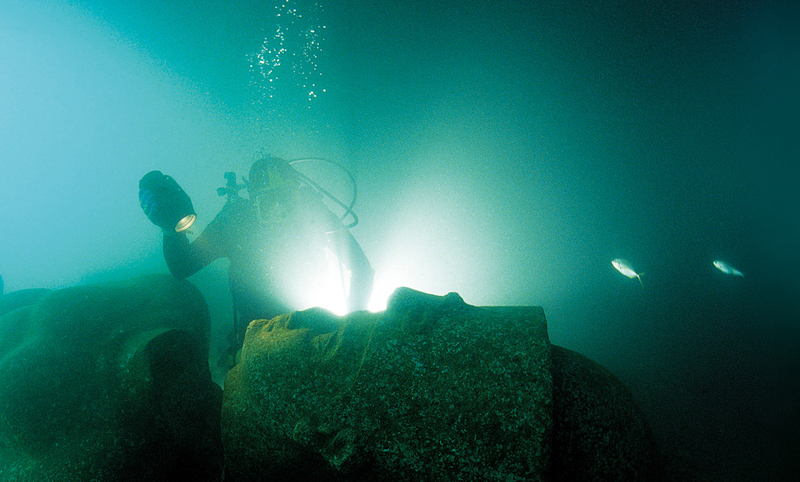 The new ‘blockbuster’ exhibition, disastrously named Sunken Cities: Egypt’s Lost Worlds, concerns two ancient cities discovered on the coast of Alexandria in the Nile Delta – not far from which lies BP’s biggest Egyptian offshore gas project. “BP is proud of its successful history of over 50 years in Egypt. We are working to meet Egypt’s domestic market growth by actively exploring the Nile Delta and investing to add production from existing discoveries”. “Regarding the Sunken Cities exhibit, we are also proud of our 20 year relationship with the British Museum,” the spokesperson added. In its latest annual report BP named Egypt as one of its ‘principal areas of production’, claiming to produce almost 30% of the country’s gas output. The oil giant is currently in advanced negotiations with Egyptian government over the recently discovered Atoll offshore gas field, which is being fast-tracked for production in 2018. BP has also recently been increasing its interests in the West Nile Delta deepwater concession, which includes the long-negotiated and controversial North Alexandria gas field. Reports in Egypt suggest BP could face fines from the Egyptian government for any potential delays in production at North Alexandria, where the company is yet to produce any gas despite having held concessions in the region for over twenty years. BP denies facing fines, claiming that the project is ahead of schedule as per its latest agreement with Egyptian government. As one of Egypt’s biggest foreign investors – with a history of oil and gas extraction in the country stretching back over half a century, plus multiple active projects today worth billions of dollars – activists claim BP could stand to benefit from sponsoring a flagship exhibition on the country at an internationally renowned museum attended by senior diplomats. The museum is currently under investigation by the Museums Association for acquiescing to the demands of its corporate sponsor following Art Not Oil’s revelations about BP’s influence over the Mexican Days of the Dead festival and Indigenous Australia: Enduring Civilisation exhibition in 2015. In November 2015 BP’s CEO Bob Dudley met Egypt’s military leader President Abdel Fattah el-Sisi in the UK to discuss a preliminary deal to fast-track production at the recently-discovered Atoll offshore gas field. BP has said that the deal will likely be sanctioned in 2016. “The agreement was signed with the Egyptian Minister of Petroleum,” he added. But BP’s involvement in Egypt in recent decades has not proved popular with some Egyptian citizens. Beginning in 2011, the residents of Idku, a small town 35km east of Alexandria, protested against BP’s plans to build a facility on their shores to process gas extracted from the North Alexandria block. Idku is primarily a fishing and agricultural community and as such is highly dependent on the local environment, which campaigners maintained could be threatened by the pipelines and treatment facilities BP planned to build on the beaches. Residents said they were not opposed to industrial development in Egypt, but could seen no benefits from BP’s plans – just environmental risks. After 18 months of numerous delays to the project caused by local opposition, BP withdrew its plans. The introduction of the controversial Protest Law under Sisi in 2013, however, curbed citizens rights to organise protests. Soon after the law’s introduction, BP announced it would be returning to the area to build the facility after all. BP worked in Egypt throughout the regime of former dictator Hosni Mubarak – in a 2010 press release BP claimed to be Egypt’s single biggest investor, having poured $17bn into the country to date – and has faced criticism for its role during the Arab Spring uprisings that saw Mubarak removed from power. As Egyptian protesters were facing violent repression in early 2011, BP Egypt Chairman Hesham Mekawi praised the ‘stability’ of Egypt under Mubarak, who oversaw three decades of emergency law during which he faced no democratic opposition to his leadership, and citizens’ rights to dissent were restricted. There is no suggestion that BP supported government moves to curb Egyptian human rights. BP has been negotiating with successive Egyptian governments over North Alexandria since 1992, yet has so far failed to produce any gas from the region. A deadline in 2001 for production to start came and went without the Mubarak regime implementing its right to put the field up for auction. Finally in 2010 a new deal was struck, described as “groundbreaking” in the trade press as it changed the usual terms relating to how Egypt may benefit from any future production. In a November 2015 amendment to the deal, fines were introduced by the Egyptian government as penalty for any further delays. Speaking to Unearthed the firm now claims to be ahead of schedule (as per the March 2015 agreement) and says that, therefore, it will not face any fines. Critics of the long-negotiated deal have suggested BP has benefited from Egypt’s weak bargaining position. Years of alleged mismanagement in the energy sector, billions owed to foreign energy companies and country-wide blackouts may have allowed the UK firm to secure a more beneficial deal. The tortured process may have cost Egypt up to $32bn in lost revenues, according to one estimate. Thanks to new investment legislation brought in under Sisi, citizens can no longer bring legal challenges against the deal.